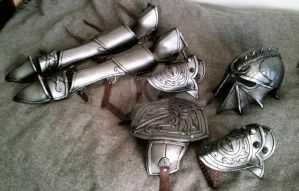 The props for my Dragon Age Inquisition costume, which I will post pics of as soon as I get some nice ones. Bow was modeled on the Bow of Cleansing Fire and made from Sintra and foam core with raised detailing, the handle was wrapped in a faux leather with a reptile texture (I don't know about you, but I spent a lot of time dragon-slaying!) It's very lightweight, and I also designed it so it comes apart at the handle to make transportation easier. The quiver is a slightly flattened PVC pipe covered in suedecloth and detailed; arrows were made from wooden dowels, stained, hand-fletched with real feathers, and tipped with foam heads. If you're interested in commissioning a similar prop, feel free to hit me up! Looks awesome! Though I prefer the dual-blade approach, myself. I'm actually planning on replacing it with dual blades at some point. Much easier to haul around a con.